What are the keyboard shortcuts for QuickBooks Online? Note: Mac users can try these shortcuts using the CMD key instead of Alt or CTRL when noted below. You can download and print a copy of the QuickBooks Online Keyboard Shortcuts reference guide. Note: This reference guide is available in English only. To access this screen, simply hold CTRL + ALT + ? (for Windows) or Control + Option (Alt ) + ? (for Mac). CTRL + F (works in Internet Explorer, Firefox, and Chrome, and Internet Explorer) will bring up a pop-up window to do the search. Chrome opens a search field at the top right of the screen. Press Alt+down arrow to open the pop-up calendar icon to the right of a date field. In any Amount or Rate field, enter a calculation. When you press Tab, QuickBooks Online calculates the result. Use the Tab key to go forward. Use Shift+Tab to go back. Space Bar to check a checkbox field. Type the first few characters of the parent item until it is selected. To jump to the list of sub-items, type the first few characters of the sub-item until it is selected. Press Alt + down arrow to open the list of sub items, and then press down arrow or up arrow to scroll through the sub-items. From any form, press Alt + S instead of clicking Save. In Firefox and Chrome, you must use Alt + Shift + S. For Mac users it is Option + Control + S.
Hold down the Alt key. If the button names have underlined letters, you can keep the Alt key held down and type the letter to select the button you want. 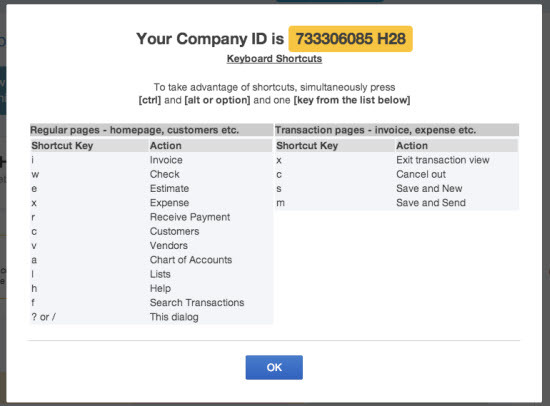 In a new, yellow transaction row, press Shift + Tab to select the transaction type field. Press up arrow or down arrow to move through the list, or type the first letter of the transaction type you want. If there are two transaction types that begin with the same letter, type the letter twice to select the second one. For example, type C once to select Check, and type C the second time to select Cash Purchase. Press Tab to select the transaction type and to move to the next field. Once you are familiar with the transaction types available, you can tab to the field and type the first letter without opening the list. Press + to increase the Ref #. Press - to decrease the Ref #. Type T to enter To Print in the Ref # field for a Check, Bill Payment (from a checking account), or Paycheck. Press Alt + S to save. Alt + Shift + S (for Firefox and Chrome). Press Alt + E to edit a saved transaction. This opens the transaction form. Press up arrow to select the transaction above. Press down arrow to select the transaction below. Select the Vertical or Horizontal field, and then press "+" to raise the number or " - " to lower it. You must use the keys on the numeric keypad. In the Journal Entry screen, press up arrow to move to the distribution line above and down arrow to move to the one below. That's it. You now know the keyboard shortcuts available in QuickBooks Online.